Starwood Hotels & Resorts Worldwide, Inc. (NYSE:HOT) today announced the opening of Sheraton Dubrovnik Riviera Hotel, a 251-room hotel owned by Hoteli Dubrovacka Rivijera d.d. Starwood Hotels & Resorts Worldwide, Inc. (NYSE:HOT) today announced the opening of Sheraton Dubrovnik Riviera Hotel, a 251-room hotel owned by Hoteli Dubrovacka Rivijera d.d. As part of the Sheraton brand’s goal to open 150 new hotels by 2020, Sheraton Dubrovnik Riviera Hotel marks the inaugural entry of the brand into southern Croatia’s Dalmatian Coast, and features a charming beach, full-service spa and luxurious outdoor pool. Sheraton Dubrovnik Riviera Hotel is set on the spectacular Adriatic coast along the Dubrovnik Riviera. The newly constructed property is a short distance from Old Town Dubrovnik, a UNESCO World Heritage site, as well as numerous cultural, historical and natural attractions, including museums and galleries. Easily accessible from the Dubrovnik airport, the Sheraton Dubrovnik Riviera Hotel boasts 240 spacious guest rooms, including 11 suites with terraces, and provides sweeping views of the secluded bay and mountainous backdrop. The hotel’s contemporary interior design is inspired by Dubrovnik’s culture and surroundings, including the medieval terracotta rooftops, coral from the Adriatic Sea and traditional Dalmatian filigree jewelry. With 1,400 square meters of meeting and event space, including a 900 square meter congress room, Sheraton Dubrovnik Riviera Hotel offers the largest hotel conference facilities in the region making it an ideal choice for celebrations and business functions. The hotel also features a range of leisure facilities such as Shine Spa for Sheraton™, the well-equipped Sheraton® Fitness Centre, indoor and outdoor swimming pools, tennis courts and a picturesque beach. The hotel features several restaurants and bars, serving both international and local Croatian cuisines, and providing a stylish setting with floor-to-ceiling windows and impressive views. The lobby also serves as a relaxing social space where guests can indulge in Paired, Sheraton’s imaginative new lobby menu comprised of artisanal small plates and bar snacks paired with premium wines and craft beers. 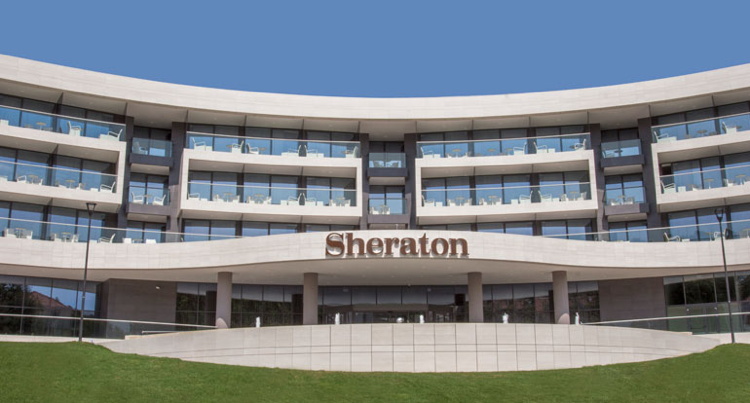 Sheraton Dubrovnik Riviera Hotel joins Starwood’s collection of hotels in Croatia representing three of its lifestyle brands: Sheraton Zagreb Hotel, The Westin Zagreb and Le Méridien Lav in Split. The Sheraton brand currently has many initiatives underway as part of Sheraton 2020, a comprehensive plan designed to solidify Sheraton as a leading global hotel brand of choice, everywhere. Several other recent announcements under the Sheraton 2020 plan include the launch of Sheraton Grand Hotels; the introduction of the new imaginative lobby menu Paired; the richest SPG promotion in the history of the brand, and the launch of the Sheraton brand’s new visual identify and re-designed website, Sheraton.com. A nod to the plan’s clear five year vision, Sheraton 2020 also includes a new $100 million Sheraton-focused marketing campaign; continuous innovation of the Sheraton guest experience; an unwavering commitment to service excellence; the implementation of revenue and profit-driving initiatives to benefit owners and developers; and a goal of opening more than 150 new Sheraton hotels worldwide by 2020.